1247. Edward ROCO4 was born on 29 December 1970 in Chicago, Il.. He was educated Bachelor of Science in Chemistry in 1994 in Loyola University. He was educated in 1994 in Loyola University; Education: Bachelor of Science in Chemistry. In October 2000 Edward was a computer analyst in Allstate Insurance. In October 2000 he was in Allstate Insurance; Occupation: computer analyst. He is also known as Ed (Boyet when he was younger). A great musician (says his wife), he plays the percussions and the piano. He is also an apprentice T'ai Chi instructor. A great musician (says his wife), he plays the percussions and thepiano. He is also an apprentice T'ai Chi instructor. 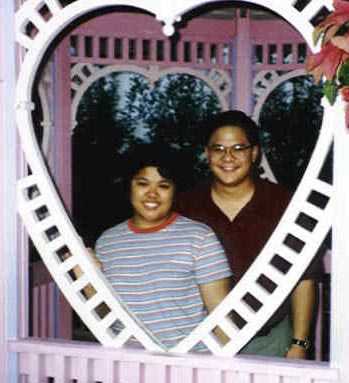 Edward ROCO and Clarinda SORIANO were married. Clarinda SORIANO4 was born on 17 March 1972 in Chicago, Il.. She was educated Bachelor of Science in Nursing in 1994 in Loyola University. She was educated in 1994 in Loyola University; Education: Bachelor of Science in Nursing. Clarinda was a Nurse Coordinator in Abbott Laboratories in the Global Pharmaceutical division. She was in Abbott Laboratories in the Global Pharmaceutical division; Occupation: Nurse Coordinator. She is also known as Letlet. Fluent in Spanish and Tagalog. Can also play the violin. Check her out at the Keanu Reeves movie "Chain Reaction". Fluent in Spanish and Tagalog. Can also play the violin. Check herout at the Keanu Reeves movie "Chain Reaction". i. Elazar Joseph ROCO4 was born on 1 February 1993 in Chicago, Il.. He was educated Pre-school gifted program in Kiddie Junction. He is now in grade 3 at Terrace Elementary School. He was educated in Kiddie Junction; Education: Pre-school gifted program. Elazar is also known as Eli. He started piano lessons in 1997 at the Chicago Suzuki Academy and is now an accomplished pianist. He has just taken up the cello. He started piano lessons in 1997 at the Chicago Suzuki Academy and isnow an accomplished pianist. He has just taken up the cello. He is now in grade 3 at Terrace Elementary School. ii. Clarrisa Rosario ROCO4 was born on 17 May 1999 in Illinois Masonic Medical Center, Chicago, Il.. She is also known as Che-che. She loves to sing.